.......Anna Phylaxis that is. Poor allergic Madeline. This picture was taken about two years ago (I so miss the toothless grin!) when Madeline started her allergy shots. As of last night, we decided to end the shots. Part of me is happy to be through with it, but part of me is sad that we're admitting defeat. As I said, she's been doing this for over two years. We knew from about age 5 that Madeline had allergies. She got several ear infections and the doctor was sure they were allergy-related. So, when she was about 7 we had her tested for allergies. I was worried that "dog" would be the main culprit, but thankfully the pooches could stay. No, she was allergic to trees and grasses. The allergist said that he couldn't adequately express how large her reactions were--the swelling from those two needle pricks covered her whole back. He felt that the best option for her was the immunotherapy allergy injections. She'd get small amounts of her allergens injected twice a week, increasing dosage and hopefully decreasing frequency until her body didn't react to those allergens anymore. 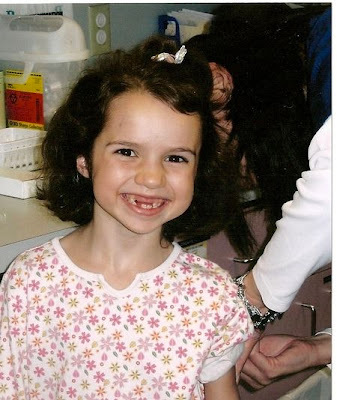 We knew it was a fairly long-term commitment, but the idea of her living allergy-free in just a few years was worth the time, effort and money we put into doing the shots. The allergist said that in Madeline's age group, they had a 95% success rate. We never got up to the elusive "maintenance dose" when she'd get a shot only every month. The best we ever got to was every 2 weeks, but that didn't last long. Her first anaphylaxis-type episode happened about a year ago and really took us by surprise. She'd had her injections and we were sitting in the office, waiting for the required 20 minutes to pass, when she went into the bathroom for a tissue. When she came out, I thought she'd been crying because her face was so red and her eyes were watering. When she talked, it came out as a wheezy, "I feel really scared." Thankfully the doctor didn't have to use the epi-pen, but they used the albuterol treatment and oral benadryl and they watched her for about an hour until her breathing was back to normal. A few months later we had a repeat of that. Each time they had to back off on the dose and have her come in at more regular intervals. Recently, we'd actually already left the doctor's office after our usual 20 minutes, when I heard Madeline wheezing in the backseat. I rushed her back to the doctor's office. This time she had welts on her face and arms and of course she looked totally terrified. I didn't feel so great either. Again, no epi-pen, but it was close. So, after that episode, Madeline was now very nervous about not just the shots, but leaving the doctor's office. They started doing peak-flow tests of her breathing before and after her injections just to make sure she was o.k. Last week we had yet another anaphylaxis moment which had Madeline in tears and the medication she got to stop the reaction knocked her out for the rest of the day. She went to sleep at 5:00 and we couldn't get her to totally wake up until 7:30 the next morning, crying because she hadn't been able to do her homework. So, last night Lyle and I had a chat with the allergist and he agreed that after over 2 years of this, we can certainly say we gave it our best shot (well, about 200 shots!). He also was worried about her escalating reactions and admitted that most kids are as good as they're going to get after 18 months. So, sadly, that just leaves us with epi-pens in strategic locations (school, purse, car, house) and albuterol inhalers and a boatload of Loratadine. I so wanted her to not be limited in her outdoor activities--and mostly she's not, we just have to be careful. She's an amazing, hardworking, talented girl and I hope and pray this won't become a big deal for her in her life. We'll see how she does now without the shots and reconvene with the allergist in 6 months. I guess the pacific northwest just isn't a great place for a kid with a tree allergy! Maybe we'll move to the desert. Knowing Madeline though, she's probably allergic to cactus!